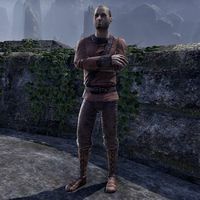 Jonah Marose is a Breton refugee from the town of Crestshade found hiding in a tower with his mother, Reynine. He pleads from the entrance of the tower. "Go away! Leave us alone! I don't want to become a bloodfiend!" He retreats into the tower, leaving you to defeat some Montclair enemies. Afterwards, he is found at the top of the tower. "Stop talking to me! Bad voice, go away! Mother, please help me! We'll make you better, Mother! I promise!" "Quiet! The bad one will taste your words in the air. He's coming closer. Bloodfiends accompany him... so many bloodfiends .... They want our blood!" Are you saying that Reezal-Jul is near? "I saw Reezal-Jul in a dream. It was the night Crestshade was attacked. I could feel his presence. Now I always sense him. He watches. He waits. He's... he's... he's coming for us. Mother's worried sick about all this." You should come back to the camp. It's safer there. "No! No, no. That would be bad. I scared the others. They didn't like me. Besides, I don't want to draw Reezal-Jul to the camp. Tell the Captain I'm sorry. I'll stay here. Maybe he'll leave the camp alone if I hide here with mother." Is your mother all right? "Mother? Mother's fine. Fine, fine, fine. I'm fine too. We're all fine here. Fine, fine, fine." You meet him again outside Shadowfate Cavern, beside his mother, who is feasting on a dead Giant Bat. "Mother is hungry, but it makes me a little sick to watch her eat. Are you looking for the Captain? They dragged her into the cave. The Bad One is going to do terrible things to her." "Reezal-Jul likes to take parts from different bodies and make entirely new creatures. That's probably what he'll do to the Captain. Or turn her into a bloodfiend. The cave is full of vampires. Maybe you should use the secret tunnel." Did you see Reezal-Jul with the Captain? "I tried to help the Captain, but they just pushed me away. Reezal-Jul just laughed. He laughed at Mother, too. I hate hearing his voice. I hate what he's doing. I wish... I wish I was home. We had a garden. We grew vegetables. Now it's all gone." [Intimidate] Secret tunnel? You need to tell me where the secret tunnel is! "Please! Please don't hurt me! I need to take care of Mother. I'll tell you what you want to know. The tunnel is over there. It's small. Hard to spot. Secret. I saw Reezal-Jul come in and out of there." Show me where the tunnel is. He shows you the entrance. "There! I helped. Mother always says I should help others. Just squeeze through there." This page was last modified on 21 February 2019, at 22:38.